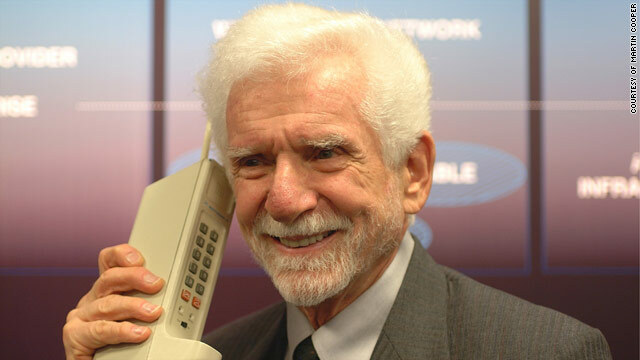 Martin Cooper talks on the "DynaTAC," the first commercial cell phone, which hit the market in 1983.
Cooper: "We knew that someday everybody would have a [cell] phone"
(CNN) -- In 1973, Martin Cooper changed the world, although he didn't know it yet. Cooper and his team at Motorola, the communications company, created maybe the only thing that runs the lives of business professionals and teenagers alike -- the cell phone. It was the size of a brick and wasn't commercially sold for another decade. But as Cooper demonstrated on a New York sidewalk, it worked. The concept of cellular technology had already been created by Motorola's rival, AT&T, whose Bell Labs introduced a system allowing calls to be moved from one cell to another while remaining on the same channel. But AT&T was focusing this technology on the car phone. Cooper wanted people to have freedom to talk on the phone away from their cars. So in reaction, he and Motorola embarked on a project to create a more portable device. Motorola spent three months building a prototype for a portable, mobile handset that Cooper publicly demonstrated in April of 1973. The company's first commercial cellular phone, the "DynaTAC," went on sale 10 years later. Cooper, now 81, is founder of ArrayComm, a company working to improve cellular networks, smart antenna and wireless communication. He and his wife are also inventors of the Jitterbug, a simplified cell phone geared to senior citizens. 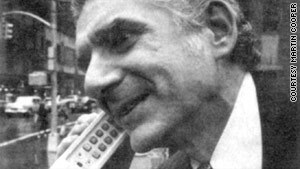 Martin Cooper placed what's recognized as the first public cell phone call in New York City in 1973.
Cooper was surprised when his landline dropped our call. After calling him back on his mobile, we had a chance to ask him about the creation of the device that changed the face of communication as we know it. CNN: What was the technology climate like back in 1973, and what gave you the idea to move with the cell phone and compete with AT&T's car phone? Cooper: There were no large-scale integrated circuits, no computers, no closed-circuit televisions, no LCD screens -- I can't tell you all the things that did not exist in 1973. But, we'd been building phones for years and years in cars, and we [Motorola] thought the time was ready for personal communication, 'cause people are just naturally mobile. For 100 years, people wanting to talk on the phone have been constrained by being tied to their desks or their homes with a wire, and now we're going to trap them in their cars? That's not good. So we decided to take on AT&T. By 1973, we decided to put on a dazzling presentation, and I decided the best way to do that was to build a phone and have someone actually have the experience of talking on a real personal handheld telephone. And that was the genesis of that phone that we built. When did you make that first phone call? Who was it to? I thought everybody knew the answer to that question! The first public call was made out on the streets of New York. It was to [Joel S. Engel], the head of the cellular program at AT&T. I called and told him, "Joel, I'm calling you from a cellular phone, a real cellular phone, a handheld, portable, real cellular phone." I don't remember exactly what he said, but it was really quiet for a while. My assumption was that he was grinding his teeth. He was very polite and ended the call. When asked about it, he says he has no recollection of this moment. What were the reactions to the cell phone like? Did people think it was unbelievable, impossible, unnecessary? Well, people were dazzled by the concept! It was beyond imagination that more than half the people in the world would have these phones. But people were absolutely amazed by the fact that you could hold the phone up to your ear, walk around and make a phone call. Remember, there were not even any cordless phones at that time. We had a press conference [in 1973], and I handed the phone to this young lady journalist and told her to make a phone call. And she said, "Can I call my mother in Australia?" and I said, "Sure!" And she did that. This woman was just spellbound, she couldn't imagine how this little phone could reach more than halfway around the world, and talk to her mother who actually answered the phone. Sophisticated New Yorkers were standing there with their mouths open. The reception was quite extraordinary. The chairman of our company happened to be in Washington the time we did the next demonstration [in the early 1980s]. He visited with the vice president ... [George H.W. Bush] ... and showed him this new phone, and he was so taken by the phone. He said, "Well, I have to show this to Ron." And the next thing you know he was showing it to Ronald Reagan. And Reagan asks, "What's keeping us from having this?" What did the phone look like? How much did it cost and who actually bought it? The phone [was] about 10 or 11 inches high, about 1 1/2 inches across, and about 4 inches deep. It weighed about 2 1/2 pounds. If you think about it, this is not a commercial product and if you had to build one it would cost about a million dollars. By the time we built a commercial product, it was 10 years later. We didn't sell that product until October of 1983, and the phone then cost $3,900. So that would be like buying a phone today for $10,000. That's quite a lot of money. Who actually bought these phones? Well, I wouldn't say it was large number of people; in fact it was a very small number. In the beginning it was wealthy people, but also people who had to be on the move. It was for people like real estate agents and doctors, who were already more accustomed to technology because they were using pagers. Cell phones didn't really get to be a big deal til about another seven or eight years later. Everybody thinks that the cell phone has always been here and that it's always been popular, but it wasn't until 1990 -- before there were as few as a million cell phones in the world -- that's where it started to really explode. Did you ever think the phone would ever be available to everyone? Well, we knew that someday everybody would have a [cell] phone, but it was hard to imagine that that would happen in my lifetime. And now we've got almost five billion phones in the world. Wow. How do you feel about the advancements cell phones have made, especially with features like apps and cameras, etc.? I must tell you as much as we were dreamers, we never imagined that all these things could be combined into one, and I'm really not so sure that it's a great thing. Phones have gotten so complicated, so hard to use, that you wonder if this is designed for real people or for engineers. I think what's really going to happen is we're going to have a lot of different kinds of phones when our industry grows up -- some that are just plain, simple telephones. In fact, my wife and I started a company, and she designed the Jitterbug, which is just a simple telephone. What kind of phone do you have now? I'm sitting here looking at all of my phones. I'm talking to you on a phone I'm trying out for a company in Europe. It's called the Vertu, and this phone starts at $5,000. And that's for the very cheap model. You could buy a solid-gold version of this phone. So this phone, even with inflation, costs about half as much as your first cell phone. Yep, and really this phone is not a really complicated phone. It does have a phonebook in it, it does reach certain parts of the Web, but it's not a PDA. You can't read e-mail on it; it doesn't have a camera on it. It really is a basic telephone. I also have a Droid. I got a Motorola Droid that I use. I also have a Jitterbug. I'm always trying whatever the latest telephone is. I had an iPhone for a while, I gave that to my grandson. Kids are really caught up in that. But I think that the Android phones are catching up now, and the latest version of the Android phones are every bit as good, if not better, than the iPhone.